Close your eyes and imagine the world of online marketing from some 15 years ago. Now picture it today, with the boom of social media and digital technology. Start from analyzing your own behavior. Do you like to read advertising texts and look at static images, or do you prefer to get all the info you need in as little time as possible, preferably in a video format? The landscape of content marketing has significantly changed in the last decade, and now the success depends on giving the consumers exactly what they want, and in a format that best corresponds with their habits. People search and interact with content more and more through their mobile phones and tablets, phasing out computers. They look for a cutting-edge content that is at the same time concise and relevant. Video marketing perfectly fits with such prescriptions. It is succinct, engaging, and can cater to the fast-paced lifestyle where information are sought on the go. This graph from the recent HubSpot video marketing research shows current trends. 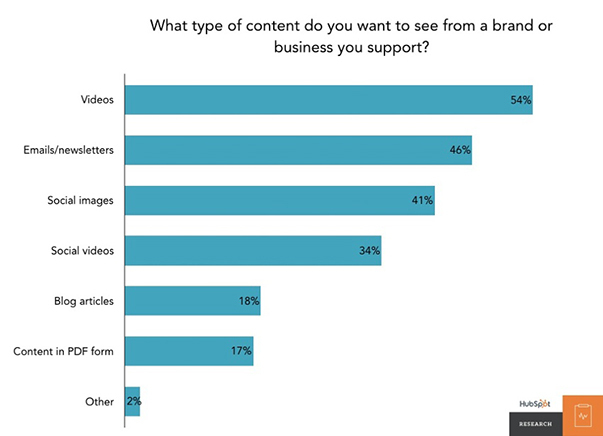 As you can see, video tops the chart of desirable content customers expect from brands. Image by HubSpot. What experts say about video marketing? Experts have been exploring the importance of video marketing for quite some time now, making predictions and observing trends. Here is some of their data in several bullet points. Conversion rates can increase by 80% if you embed video in landing pages. 90% of customers stated that product video helped them with purchasing decisions. Mobile video consumption has a 100% yearly rate increase. Video content is currently used by 87% of online marketers. It is projected that by 2019 videos will claim over 80% of all web traffic. These findings suggest that videos will play the most important role in marketing in the future. They will claim the greatest part of online traffic and are already the deciding factor in conversion rates and engagement. Hope Horner, the CEO of a video marketing and production company explains that videos today are what websites were approx. 20 years ago. Customers now prefer sites that contain videos, instead of static images and texts. "Videos are the No. 1 way to showcase your brand to your customers. They help you stand out among the crowd. Plus, they allow you to build an emotional connection with your audience and transmit the feel, tone, and details of your brand in 60 seconds or less." Emotional factor is surely among the crucial ones that affect online sales, conversions, and other stuff helping your business. Telling a compelling story with animation, sounds, or even live actors is much more effective than offering a plain text or images. Here is one great example of how Conductor promoted their SEO and content services. Now imagine the same story presented to you as a several-pages text. Would you have patience or even time to read it? What would stick in your mind longer – text or the image of this arguing couple on therapy? Another fantastic example of a good video marketing is the video intro for Pixar. Even if you are not a big fan of cartoons, you probably know the jumping lamp stint in their intro video. Lasting only a few seconds, the video perfectly shows the quirkiness and a child-like curiosity that informs the studio’s work and furthers their message of a care-free entertainment. This short intro became iconic of Pixar and has contributed significantly to the worldwide recognition of the brand. As the above examples show, you cannot go wrong if you choose video marketing as your marketing strategy. It is cut for the urban and fast-changing world where we have less and less time to devote to careful watching or in-depth research before shopping. The first impression counts most. Sorting all this out with a great video will bring you more engagement and your message will be conveyed in an effective way. You’ll give your brand a more professional and trustworthy look. Your online presence will increase also, which will lead to more subscribers and sales boost. Can it work for small business as well? Absolutely. Video marketing is not something reserved just for the big players. While in past it was rather expensive to create a video, today with expansion of internet and different software you can have your video done literally in minutes. Think about the potential reach videos have. Just in the UK one in three persons watch at least one video a week, which sums up to more than 20 million potential viewers. No other content can achieve this. More and more small businesses use video to reach potential customers. Additional research shows that video is peerless when it comes to engaging customers. Even if you are a small, local business that aims to attract local customers, you are better off with video. With generally low production costs making a video is no longer a challenge as it used to be. You don’t even have to be a tech wizard to create your video, as online video makers now offer intuitive and simple design interfaces where in just a few easy clicks you can have your video done. There is literary nothing today that can stop you from exploiting the benefits of video marketing. 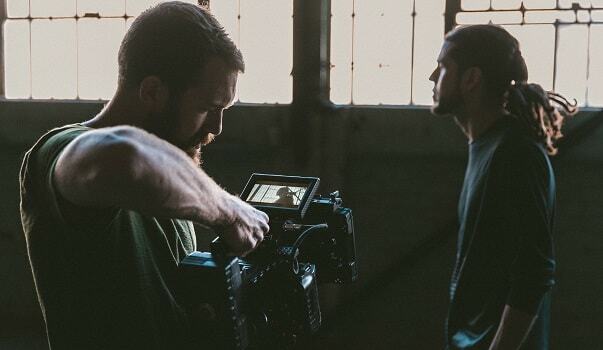 Choose your favorite online video maker and start creating today! We asked you at the beginning to imagine how marketing world looked like years ago. Back then videos were still expensive to produce. With the technological advances this has changed over the years. Today, digital technology is cheaper than ever before, and there are no limits to distribute your content worldwide through internet channels. Having no video marketing strategy is no longer an option. As numbers and facts from above show, miss out on having a marketing video, and you’ll miss out on having a successful business as well. The good news is that you can create a quality video from your home or office by using online video services and at a much lower price than video marketing studios would charge. However, it is important to always look for professional quality if you want your message to reach the audiences across the globe. Creative, intelligent, and engaging videos are your best option, so don’t settle for less if you aim for success!